Earlier this year, we did a piece on long-term care pharmacy. 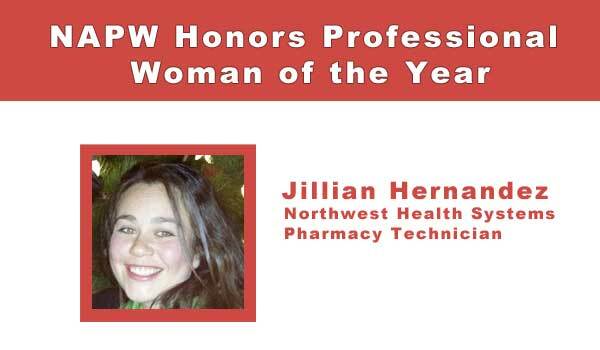 It was inspired by pharmacy technician Jillian Hernandez after she was named Professional Woman of the Year (2013/2014) by the National Association of Professional Women. Hernandez has been working as a pharmacy technician for over a decade. She is currently the e-MAR Specialist at Northwest Health Systems. The Spokane, WA, company specializes in medical supplies and long- term care pharmacy services. We are honored that Hernandez took the time to share her professional and educational experiences, the unique and specialized role she currently fills, and some advice for those interested in a pharmacy technology or related career. PTS: What inspired you to first start working as a pharmacy technician? JH: I began working as a pharmacy technician the summer after my freshman year of college. I was interested in pharmacy and volunteered full time at a hospital pharmacy in Toppenish, WA to get the hours for my license. PTS: What types of positions have you held in your over 10 years in pharmacy technology and what did these involve? JH: I worked hospital pharmacy during school breaks while I was attending Whitman College. During this time I became proficient in IV admixture and Pyxis machines. While I was attending Washington State I worked retail pharmacy. This gave me the customer service experience I had not received in the hospital. PTS: What is your current role at Northwest Health Systems? JH: My role at Northwest Health Systems is training assisted living medication staff on proper medication administration in order to ensure the 6 Rs (right resident, right medication, right dose, right time, right route and right documentation). The training involves instruction on Medication Administration Records (MARs), including both paper and electronic; the proper oversight for nurses regarding MARs; and proper medication storage techniques. I am also involved in training pharmacy staff to understand the facility side of things, for example what is a MAR, how does the data entry process affect that MAR, and why the job doesn’t stop when the medication is handed over. In addition, I am actively involved in bridging the communication gap between the various sectors of health care we deal with in order to give the best patient care possible. For example, laws governing Assisted Living Facilities do not always take into account Board of Pharmacy Regulations such as what is an order and it is only through ensuring providers, pharmacists, and facilities are aware of the discrepancies and how we can work around them is crucial to getting medications to patients. Lastly, I am involved in technical writing and project management. PTS: What is long term care pharmacy? JH: Long term care pharmacy involves managing medications services for residents in long term care facilities. These facilities include, but are not limited to, skilled nursing facilities, assisted living facilities, adult family homes, intermediate care facilities, and supported living. A long-term care pharmacy must take into account the regulations the facilities must adhere to. For example, most facilities require compliance packaging that vials do not satisfy. Or regulations require indications on orders even if a prescriber does not write them. In addition to ensuring the medications are dispensed correctly, long term care pharmacies also provide medication administration records (MAR) to its facilities. These records allow facility staff to document administration of the medications. Lastly, long term care pharmacies are highly involved in medication reviews which are periodic reviews of the MAR to ensure there is no duplication of therapy, over-usage, under-usage, etc. PTS: What has been most rewarding and challenging working in pharmacy technology? JH: The most rewarding part is the ability to teach people new skills and the ability to work with the software programmers to enhance their programs. The most challenging part is working to get the different software to function as it should for the health care providers using it, and not necessarily how the programmers think it should. In addition, it can be a challenge explaining to people that while they may be using multiple electronic health records, not all the software communicates with each other (a.k.a. interfaces). PTS: Are there one or two highlights that stand out throughout your career so far? JH: Honestly, the position I find myself in is a big accomplishment. Few pharmacies have individuals in positions like mine, and those that do typically utilize pharmacists or nurses for the roles. So to be in this position as a technician is hug. PTS: You clearly love to learn. How have your degrees and certificate programs helped you the most? JH: All of my degrees and certifications help me in my current position. First and foremost, being a pharmacy technician allows me to understand the pharmacy side and better translate facility comments to our staff. My sociology degree allows me to look at things from the facility side. I am able to take into account the location of the facility (i.e. town), the staffing (is a nurse on 24/7), the demographic of the patients, the facility services, etc. in order to provide a more well-rounded picture when developing and implementing policies and procedures. My biology and human anatomy and physiology degrees help me in my communications with pharmacists as I am able to understand the physiology. My health services administration certificate helps me understand the business side of pharmacy. While we do want to provide medications we also have to be able to be paid for this service. People often do not want to pay or want a discount, but if we give everything away we will not be able to keep the doors open and continue providing for everyone. PTS: Do you have any advice for those considering or just starting out as a pharmacy tech? JH: While we all study a subject to gain a degree, certificate, or license, do not let yourself be put into the box that is that profession. Always be willing to learn something that helps you to see the other points of view. Pharmacy is just one aspect of the system that provides health care to the public.